Denim swatch images from Big Duck Canvas. It seems like for the longest time grey slipcovers were considered mostly for industrial decor and boys’ bedrooms. Grey fabric options for custom covers were limited to stiff, dry clean only canvas and nubby synthetic upholstery. If you shopped for grey denim online not too long ago you probably came up short. I sure did. Finding a washable, durable denim for slipcovers in a good grey was tricky. From pale ash to rich charcoal, grey cotton denim is now easier to find and has become a popular neutral for slipcovered furniture. Grey denim covers are showing up in all types of home decor: farmhouse, coastal, cottage, cabin, transitional and modern. My favorites are the darker shades. They look fantastic after washed….that’s when the magic happens. The grey color gets a bit ashy meaning it fades ever so slightly giving the denim (twill weave) a softly worn appearance. In addition to the grey denims from Big Duck you might also like this 11 oz Charcoal Beefy Brushed Cotton Denim from Carr Textile. Why grey denim and not grey canvas? It’s a personal preference. I like the look of grey on the denim twill weave texture better than a flat weave canvas. Both denim and canvas are strong, versatile fabrics that make a good looking and durable slipcover. Consider the look you’re going for, your budget and what kind of use your slipcover will get. Buy a yard of each denim and canvas in the grey colors you like, wash them and throw them over your furniture to see which one speaks to you. Thinking of going grey on your next slipcover? Below are a few examples I think will inspire. Photo: Grey cotton bull denim slipcover by Shelley Anderson. Shelley Anderson at Slipcovers by Shelley made this wonderful washed cotton denim slipcover (above) using one of the grey colors from Big Duck. The look is comfortable and casual. Shannon at Home Made Lovely swapped out her difficult to clean white slipcover for this grey Ikea cover (above). It’s not denim but the overall look gives you an idea of how a darker shade of grey can work as a versatile neutral in a monochromatic color palette. Photo: Pottery Barn Carlisle slipcovered chairs in grey. Grey slipcovers don’t have to look dull and dreary. A rich grey shade can actually brighten a room when contrasted with a light color palette of white, cream, natural hemp and wicker tones. *The Big Duck denims listed above are my affiliate links. When you purchase a swatch or yardage I earn a tiny commission, which helps in a small way with the cost of maintaining my website. You do not pay more for these fabrics. All of my suggestions and reviews are my own. 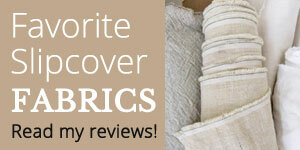 I only recommend fabrics I have used, tested or know for sure they will make a good slipcover. This entry was posted in denim slipcovers, slipcover fabrics and tagged grey slipcovers, slipcover maker in Kalamazoo, washable slipcover fabrics on November 15, 2018 by slipcovermaker.